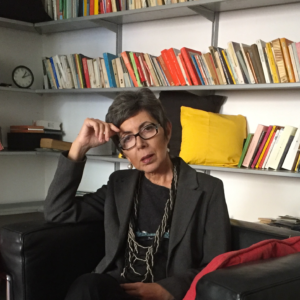 Rossella Valdrè is a psychiatrist and a full member psychoanalyst of the Italian and the International Psychoanalytical Association. After her early years in institutional work, she has the concentrated in her private practice, and a court-appointed expert of the juvenile courts. She teachs as free docent psychoanalytic theory at the Faculty of Psychology of Genoa University. Her fields of interests include cinema and psychoanalysis, the extension of psychoanalysis into the world of culture, art, literature and society, always connecting and interpretation in the light of psychoanalytic theory, focusing to Freudian metapsychology. She has several publications, books and articles, on cinema and psychoanalysis, freudian methapsychology revisted in contemporary life, and various interest and reviews. She is greatly interested in psychoanalys, Culture and contemporay life. She has published many books and partecipated to Italian and International Congress. She is a psychoanalist and a writer, living in Genoa and often staying in NYC. La lingua sognata della realtà. Cinema e psicoanalisi nell’esplorazione della contemporaneità (The dream language of reality. Cinema and psychoanalysis in the exploration of contemporaneity), ed. Antigone, 2013, Cinema e violenza: banalità del Male nel cinema contemporaneo (Cinema and violence: banality of evil in contemporary cinema. Collected papers), ed. Liguori, 2014, L’Altro. Diversità contemporanee. Cinema e psicoanalisi nel territorio dell’alterità. (The other. Contemporary diversities. Cinema and psychoanalysis on the otherness) Borla, 2015, On Sublimation: a path to the destiny of desire, theory and treatment, Karnac, 2014, and Cattive. E’ sempre la donna la vittima? Autrici che ribaltano il mito: una riflessione psicoanalitica (Malice. The victim and the couple.A psychoanalytic perspective. ), ed. Alpes, 2015 (in publication by Routledge). Her last book is “La morte dentro la vita. Riflessioni psiconalitiche sulla pulsione muta. La pulsione di morte nella teoria , nella clinica e nelll’arte”, Rosemberg & Seller, Torino, 2016. (Death inside life. Reflections about death drive in theory, clinical and art). She lives and works in Genoa, and often stays in NYC.